This work was commissioned by the music ensemble of Corpus Christi Church in Thunder Bay, Ontario. Saint Cecilia is the patroness saint of music and musicians. including her pagan bridegroom, to Christianity during her lifetime. She was martyred, dying slowly of neck wounds. 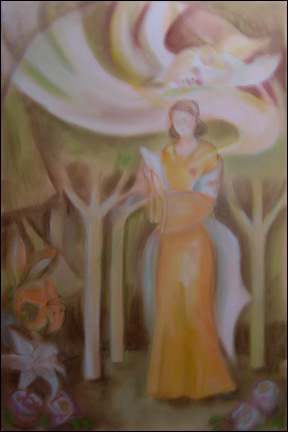 After the subject was composed and a size of 36" x 24" was selected, a Conté chalk drawing was done on the canvas. The music coming from her heart was represented by the wave of colour expanding upwards. 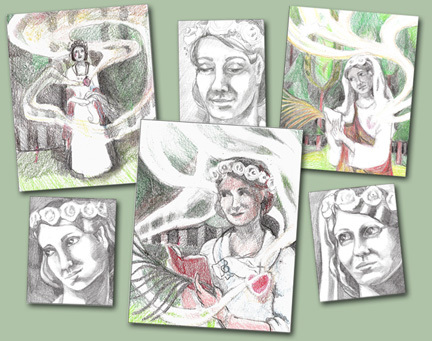 The initial sketches had her wearing a wreath of flowers as she was inspired on her wedding day. 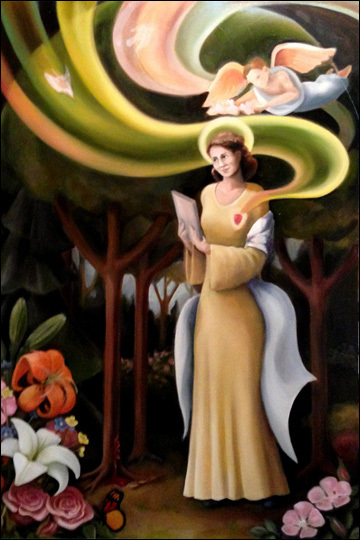 We decided the angel, sometimes referred to as fiery winged, would bring her a crown of flowers. Traditionally, the flowers for Saint Cecilia were lilies and roses. We decided to expand on that by adding tiger lilies and wild roses to reflect our environment. Also, we wanted to impart the concept of the "forest as a cathedral." 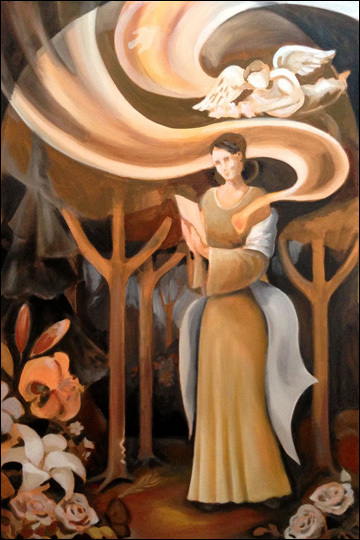 early May: The underpainting begins. 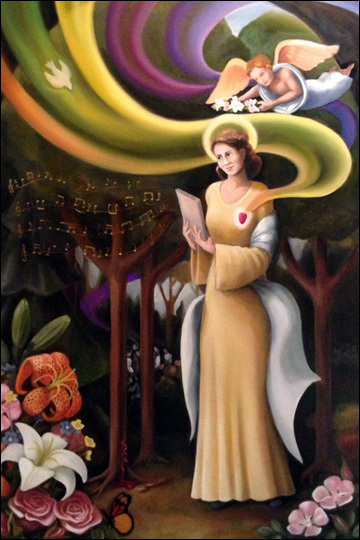 Cuts in the tree represent the three cuts Saint Cecilia received in her neck. They will drip blood. The palm frond is a symbol of martyrdom. 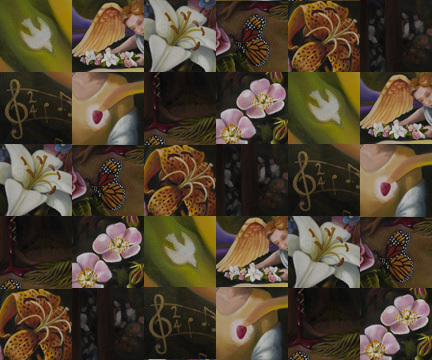 On canvas composition continues with a butterfly, depth to the forest, a wild rose bush and a dove. 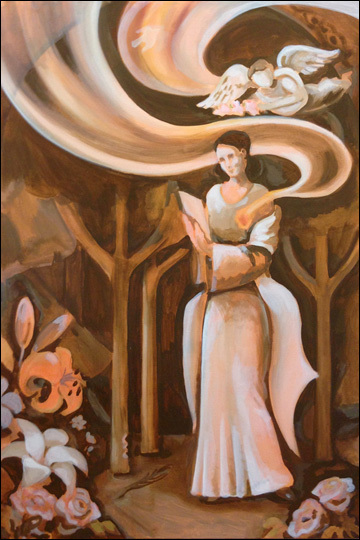 By May 7, wild roses have been added in the forest and the underpainting is finished. Oil paint starts to bring out the colours. 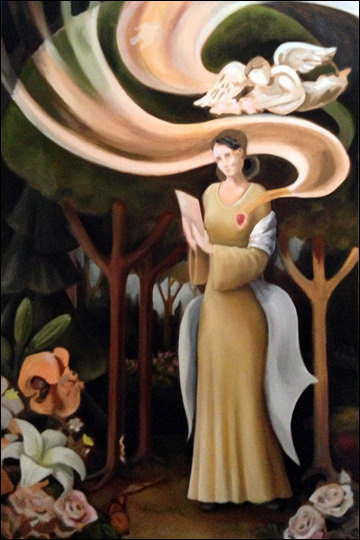 I am hesitating to work the roses in the right corner and the dove location is unresolved. 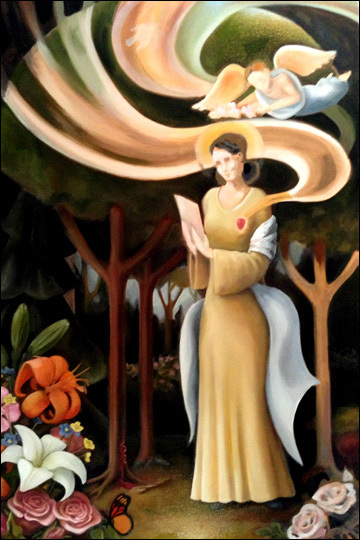 May 17: The addition of a pair of wild roses and a new placement of the dove representing the Holy Spirit improve the composition. June: The ensemble is placed in the forest with a wave of richly coloured music moving upward. June 18: We agreed to introduce the language of music to symbolize both the hymn Cecilia is viewing and to visually convey her position as the patron saint of music. This was painted with a gold paint. A small treble cleft was painted over and replaced by a larger one. Details and highlights were attended to. people: church: "Body of Christ"
In this work we decided to draw inspiration in the concept of the forest as a cathedral. A blend of deciduous and coniferous trees provide the columns, waves of music reach up to the heavens. The song lyrics include "...every heart prepare Him room" and "...heaven and nature sing" which fit the message of the work. The frame is made of cedar: symbol of Christ, and carved in homage to Christ’s work as a carpenter. It depicts the Sleeping Giant rock formation found in the harbour of Thunder Bay. The Sleeping Giant is steeped in legend and regarded as an identifying symbol for the district.